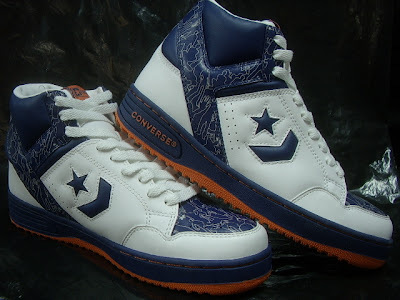 Day 2 of the Converse Century and today I bring you a sample pair of Converse Weapons. 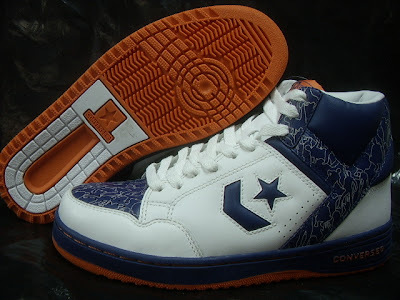 The shoes are highs in White/Blue/Orange. Possibly a shoe made for New York only. In the Y-Bar and Toe Cap areas you will see designs made with outlines of people. Most appear to be doing some sort of basketball activity. 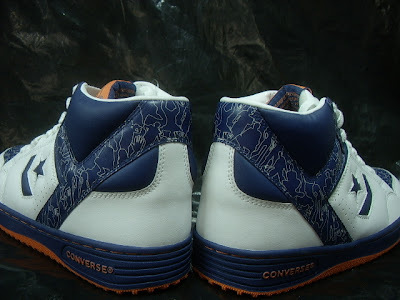 These designs have been used on other Converse shoes recently. 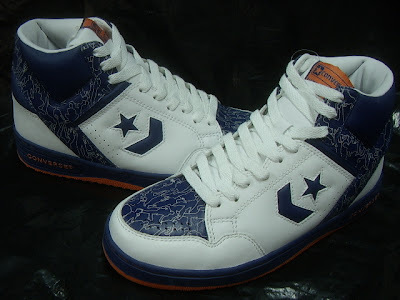 Thanks for coming to the Converse Blog. I want to remind everyone about the poll, the one right above this post, go look....no really...thanks. It just takes a second to cast a vote, I'd really like to know what everyone thinks. Alright well that will do for today, enjoy your Weapon Wednesday!